Networking is about making meaningful connections and developing a rapport with people. Every day as professional men and women, we market ourselves to people, potential prospects, and companies in hopes of establishing a partnership or business arrangement that is mutually beneficial. What can I say, we are entrepreneurs at heart – constantly seeking opportunities to pitch and promote ourselves to the first person or persons willing to listen. We do this at networking events, conferences, trade shows, random pop up conversations at Starbucks. Unfortunately, failing to follow up with people, quickly erodes every effort set forth. Why invest the time in networking if you’re not going to follow up with the people you meet? Scheduling a meeting time shouldn’t be hard. All you need are the right tools. Google Calendar is a great way to schedule follow up meetings. Whether you’re coordinating a conference meeting, working between time zones, or trying to find a time that works for you and your prospect; Google Calendar provides an intuitive way to streamline the entire process. 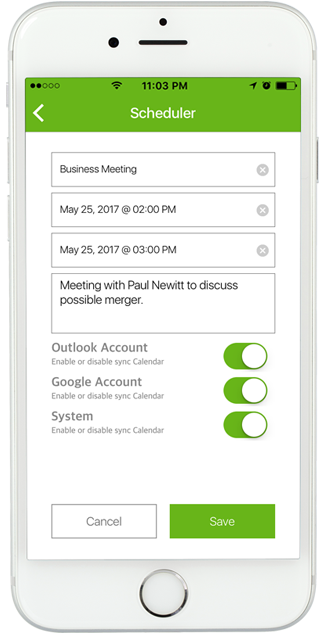 Switchit’s scheduling feature syncs with your Microsoft Outlook, Google Calendar, and iCloud accounts. After sharing your digital business card with a potential lead, open the Scheduler to create a calendar event for a follow-up meeting or create a reminder alert. Enter the date, time, and add a description. Once saved, the calendar event will sync to your Microsoft Outlook, Apple Calendar, and Google Calendar account. A “Reminder” alert will notify you when the scheduled event is approaching. This feature saves you a ton of time and helps make scheduling follow-ups less tedious. Over the coming months, you’ll see new features and integrations, including many features designed for teams and businesses. We’ll also continue to make improvements to our user experience. We’d love to hear what you think. Please email us at feedback@switchitapp.com with any suggestions. If you are experiencing any bugs or other technical problems, continue to email us at support@switchitapp.com. Feel free to go give the new app a try! Thanks for reading, and thanks for using Switchit!